Why use critical chain scheduling? Here are a few improvements that I think critical chain scheduling can give when used correctly. Critical Chain scheduling enables you to identify and focus on the shortest path of sequential activities in a project, manage schedule variation at the global level rather than at task or activity level. By placing a project safety buffer at the end of the critical chain rather than on each activity we can use buffer consumption as the status metric. 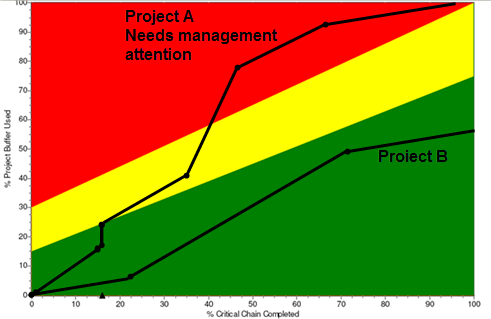 As long as the percentage of buffer consumption is less than the percentage of the critical chain completed then your project is doing ok. A core aspect of critical chain is that we are able to take care of most constraints before they impact the work, which in turn enables projects using this approach to deliver in a shorter time frame than projects using many of the other approaches to scheduling. It is important to understand that the focus is on the due date of the project and not the due date of individual activities. This means that you must not measure an individual’s performance on meeting due dates at the activity or task level. You measure the team’s performance against the estimated due date delivery metric. The beauty of the buffer as a metric, particularly when displayed in a fever chart, is its simplicity and the ease with which the team and other stakeholders can see what the status is. As buffer consumption increases, the team can easily plan and act to recover buffer quickly and before it is too late. In terms of communicating the projects time status this is very powerful. If we manage time well using the buffer metric, there is a greater probability that we will also manage cost, scope, quality and risk more effectively. 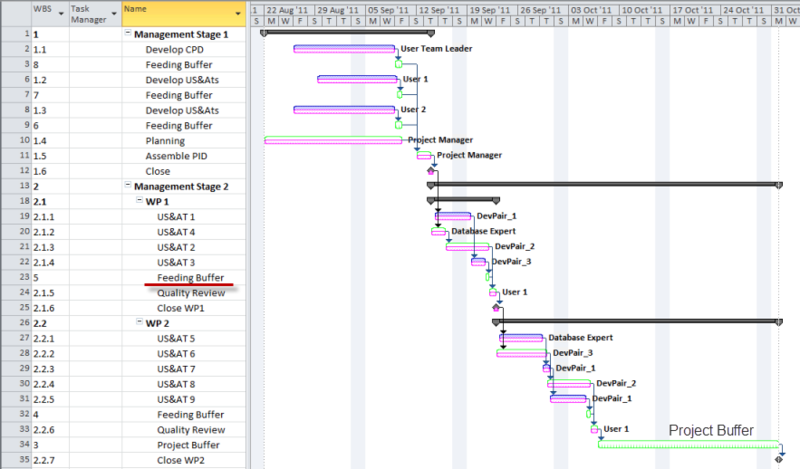 You can use Critical Chain schedules in combination with either Kanban boards or product backlogs. Use your critical chain schedule for the global perspective and the Kanban board for focusing on what is happing right now. I have worked on projects where this combination has been very effective.